You are here: Home / Appeals / Fund a Need / Raise the Paddle / Does a fund a need hurt your live auction proceeds? During the course of my consultations with clients, we often discuss how a fund a need / cash appeal can raise them additional funds. Nor has that proven to be the case at any of the 50 auctions I conduct onsite annually. Instead, my client just raises more money. We raise the same or similar live auction revenue. We raise the same or similar silent auction revenue. And by adding in the appeal, we raise another $10,000 … or $50,000 … or $100,000. Here’s are two reasons why. 1. Smaller gift givers can participate. Not everyone will participate in your live auction. 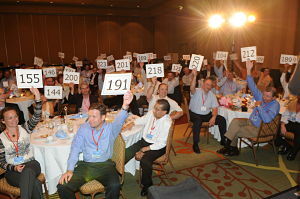 Most benefit auctioneers agree that only 10-20% of the crowd will be active in the live auction. So what are all those OTHER guests doing? How are you going to let THEM participate? Through the fund a need! An appeal lets those guests participate in the action. They, too, can raise their hand. 2. The appeal gift is usually 100% tax deductible. Live auction items are not usually 100% tax deductible. But a donation to an appeal often is! For those guests who are sensitive or savvy on tax matters, it can make a big difference. Now let me make a wedding-based analogy to further explain my point. I’ve attended a few weddings during which the bride and groom have a money dance. For a song or two, a guest can dance with either the bride or groom for a fee. I don’t think they do. I don’t think it affects the actions of any guests. Those that want to dance will dance, regardless of whether they already gave a gift to the couple. Imagine the scene. The music is jamming, guests are dining on good food and strong drinks, and everyone is chatting. In the midst of this great time, it’s announced that there will be a money dance. Joe and Helen, two of the guests, cheer and clap with the crowd: “Whoo hooo!” Joe is excited! He loves weddings and is happy for the couple. He jumps up to grab the bride for a dance. 1. Joe whisks the bride around the floor to a fast polka and slips her a $20. 2. On his way to grab the bride, Joe stops abruptly at the edge of the dance floor. “Whoa,” he thinks, “We already spent money on this couple. My wife bought bedsheets … I wrapped them earlier today. Those greedy kids. We already gave them a gift and they have the nerve to ask me for more.” Joe then thinks the better of the money dance and skulks back to his chair. C’mon. I’ve never seen the second scenario happen. The decision to make a cash gift donation occupies a different place in our psyche than the decision to bid in a silent or live auction. When presented properly to the crowd (and there IS a proper way to present it … not every auctioneer has the authenticity to elicit the same donations! ), appeals can only build your total auction revenue. Our committee wants to do raffle appeal through the mail for an upcoming wine event (which includes a silent auction). We did this for our golf tournament, which was a great way to get those involved that either couldn’t afford to golf or didn’t care to. However, our wine event has a much lower ticket price, wider appeal, and can have an unlimted number of attendees. Do you think people will buy our cheaper raffle ticket rather than purchasing an event ticket? I’m Sherry’s assistant. I’m the one primarily “in charge” of moderating the blog, so I’m going to answer this question. A raffle is when you sell tickets and the winner gets a prize. An appeal is when you ask for money and the donor doesn’t get any specific “thing or item” in exchange. Offhand, I’m not sure what a “raffle appeal” is … are you conducting a hybrid of the two? I’ll try to answer. If you are simply asking for donations via mail (I’m guessing you’ll include that info in your invitation), and you are concerned that guests will make a donation in lieu of attending your event, I wouldn’t let that stop you. There can be a lot of reasons as to why someone doesn’t attend, many of which have nothing to do with your event. It’s fine to give those guests who are going to be on vacation or attending their son’s wedding an opportunity to contribute, even if they can’t physically attend. I’m sure you’ll be running a great event, so there’s no reason to assume people will try to shirk out of attending! Typically for a cash donation, guests can give as little or as much as they want. You seem to refer to a specific price, so maybe that’s a raffle? Key point: Sell those tickets onsite, too. Put a couple of outgoing volunteers on that task to ensure everyone attending knows you’ve got a great ticket price on that raffle. Maybe some of our other readers will weigh in on this, too? Anyone?